Sisko, Quark, Jake, and Nog visit the Gamma Quadrant, but are met by the Jem'Hadar, a group of warriors from the Dominion who threaten to destroy anybody who comes through the wormhole from now on. At the risk of being a little spoilery, Deep Space Nine can be looked at as a show that goes through three major acts, and this episode marks the end of Act I. The characters have all been explored sufficiently to fall into a comfortable groove, the writers have settled on a consistent tone for the show overall, and audiences should have a good idea of what kind of show they're watching. With the bold introduction of the Dominion, we are being promised that the creators have pushed down on the gas and are bringing in a whole new dimension to a show that is already very complex. The opening scene is dripping with self-reflexive subtext. Sisko walks in on Jake growing something for his science experiment, and he complains that it's all a bit low-tech, that they should do something more exciting and interesting. I imagine there was a similar conversation in the writing room when it came time to close out the second season. From there, we are teased with a goofy, comical episode centering on Sisko's relationship to Quark and his continued inability to find quality time alone with his son, but then, quite suddenly, they stop messing around and introduce the Jem'Hadar, warriors of the Dominion. We get some brutal judgment about the nature of humanity from Quark--again demonstrating that this show isn't afraid to rebutt Roddenberry's utopic vision for Star Trek--and we are given an enigmatic baddie that is confident in its own superiority, easily taking advantage of what they must interpret to be complacency from the Federation. 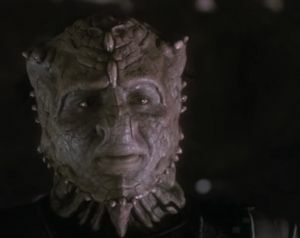 The Jem'Hadar who confronts Sisko is even disappointed that the first battle has to be between the Dominion and the Federation, as he evidently considers the Klingons and the Cardassians as more worthy foes. The fact that they also show a fair amount of guile by trying to infiltrate the station with Eris shows that they have a gift for subterfuge as well as the technological and military might of the Jem'Hadar. There's an element of theater there, which gives us an enemy with more personality than the Borg. The Dominion also promises to be more complex than other Star Trek baddies, since it is apparently made up of multiple alien races instead of just one, a kind of bizarro-Federation in the Gamma Quadrant that is shrouded in mythology. Then, as one last indication of just how terrible these guys are, they do a suicide run on a retreating Federation vessel (that not-coincidentally resembles the Enterprise), blowing it to smithereens, forcing the Federation to consider how many lives they lost just trying to retrieve Commander Sisko. All in all, an excellent season-ender. It's not a traditional cliffhanger--in that there's no "TO BE CONTINUED" or anything like that--but it definitely gets you pumped up and excited to see where the show is going next. Who are the Founders? What do the Dominion really want? Should the Federation just do what they're told and stay out of the Gamma Quadrant? What will this mean for the show going forward? Eris' tele-kinetic abilities must be some kind of trick--more theatrics--as we never see a Vorta display this kind of ability in the future. Best Episodes: "Cardassians," "Blood Oath," "The Maquis, Part II"
Worst Episodes: "Melora," "Playing God," "Profit and Loss"
It's important to remember that this season ran concurrently with TNG's final season. In many ways, it feels like both shows were deliberately trying to put distance between each other--despite the Maquis arc that runs through them--as TNG does more wild and crazy sci-fi stories while DS9 sticks to more methodic, character-driven stories. If it weren't for the introduction of the Dominion, it's easy to see how DS9, had it continued in this manner, would have run out of steam pretty quickly. It's not bad stuff--in fact it's surprisingly good in retrospect--but it's a little more contemplative and slow than the Star Trek shows that preceded it. Still, there's plenty to be said for the long build-up, and the way the writers sprinkle in little hints about the Dominion well before the reveal in the season finale is something TNG failed to pull off properly with the Borg. DS9 has built a great foundation, but it's a good thing that it now appears to be putting something on top of it.